Perfect pool water is key to enjoying time with your friends and family in the swimming pool. A swim with friends on a hot day can be a wonderful treat and create a fun memory. Don’t let it be ruined by poor water quality. Often people over complicate balancing swimming pool water. It’s not that hard and with a regular schedule it can be done quickly. Pro Tip: Regular adjustments save time and money as it is easier to maintain your levels than it is to achieve lost levels or correct algies and other swimming pool water issues. Correct water balance is crucial for keeping your pool clean, clear and swim ready. Good water balance is a bit of a balancing act. Sometimes the only way to know your levels are off is to test, however if you are experiencing any of the following issues, please start the process below. It is most likely that your water balance is off. To balance your swimming pool water follow the directions below. 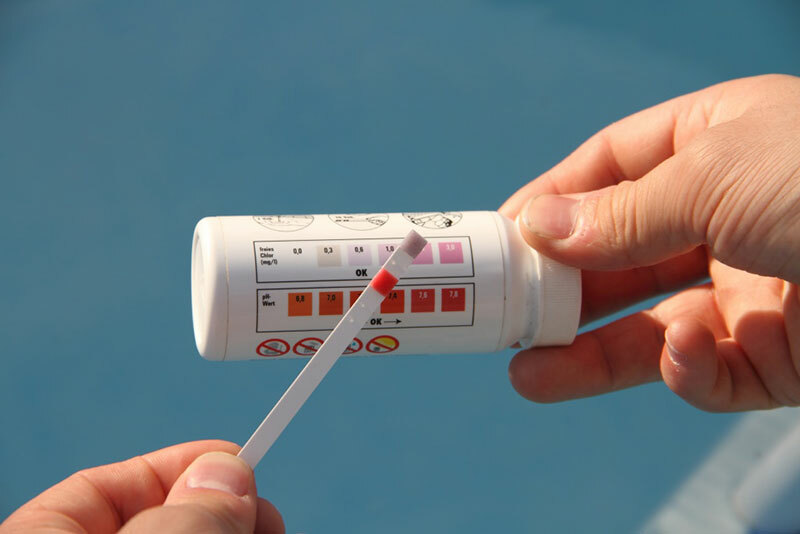 Using test strips, test pool water. Turn on the pump. Running the pump with help evenly distribute the chemicals throughout your pool. Otherwise the chemicals may remain in one area and not be nearly as effective. *Add chemicals to your pool one at a time. Allow time for each chemical to dissolve and disperse throughout your pool. If you’re in more of a hurry and need to add the chemicals all at once, make sure to add them in different areas of your pool so the chemicals will have time to settle before immediately interacting with the others. Once a month visit us with a sample of your swimming pool water and we will perform a FREE water test. Our in store testing systems are state of the art and designed to help you know exactly what you need to add to your water for the perfect swim-ready pool.